Club Penguin Cheats by Mimo777 Club Penguin Cheats by Mimo777: Club Penguin New Room Details! Notice Board: Find out which penguins are throwing igloo parties or looking for band members, for example. Tour Guide Booth: Instead of going to the Ski Village, you can find a Tour Guide or take the Tour Guide test here. Fish Fountain: This cool new addition to the island will spout water out of a golden fish's mouth! Wow! Love the idea of the Notice Board, don't you? I think Club Penguin will be moving the Tour Guide Booth from the Ski Village so it won't be in the way for the parties. Or possibly if they Mountain is opened up again. I can't wait to hear what you think about this new room. Do you think it will be coming soon? If so, when? Thanks Slidoo for this new update! Try new virtual worlds SMALLWORLDS! woot! u fixed your error..
anyways..thats cool! the new room and all that stuff! I cant believe how fast club penguin is changing! I sent an E-mail to Club Penguin! Im pretty sure it'll come sometime in November...possibly for when you get the code in Club penguin Gameday, i doubt it but its possible. Hm, i wonder what the notice board will be like exactly. i bet it'll be like Rockhoppers but with alot more features. OMG!! Im sooooo excited!!! Awesome post Mimo !! Let me know if you find out when it is coming plz! Let me know if you find out when it is coming please! Extra gasp! This will be so awesome! We won't have to advertise our parties in the town anymore and we can party at our igloo (cuz it takes forever to get ppl then play in your iggy if you made a kingdom or something). maybe it will come out in november with the water dojo stuff. Hey can you add me im kseu10 tell me where to meet and the time. Is it just me or is does it seem like the new water dojo is going to be under the water fountain in this new room? I'm excited for THIS and the fair!! woot woot im loving club penguin right now!!! I love the idea of the notice board. But i have a question- is the notice board and the igloo spot on the map basically the same thing? will the member igloo spot on the map not be there anymore...? Awesome i will be looking forward to it BTW What about the gazebo part? I like that new room thing. I guess it is like a park i dont know. i really liek that notice board thing. great find Mimo! that sounds cool. I am really excited!! What if the room was a member only room. its awsome epic u rock mimo! I have a feeling that it's coming after the fair. They usually unlock stuff then. Hopefully this will stop people spamming at the town, slowing down people. Also I like the sound of the fountain! Cool! A Fish Fountain..... could it just be that something catostrophic might happen to the ski village and the fishing game gets moved to the fountain and the tour guide booth will be moved to the town. It could happen. Anyways... Cool! OMG! That is so cool! I can't wait for this new room to come! I bet it will come for Christmas! This means that if there is that new room it won't be member only cos there is the tour guide thingy there! Yeeey! Thanks Mimo. OMG thats gonna be amazing!! The notice board sounds great! I can't wait for it to open. Club Penguin is becoming less of an island and more of a continent!! Wow, Mimo! The idea of a Notice Board sounds awesome! Maybe it could help us get the Igloo stamps too! Club Penguin just keeps getting better :) Me and my friends saw an Orange Puffle Plush & a Purple Puffle Keyring in Game the other day (We're in the UK) and we really wanted to buy the Purple Puffle, it was sooooo cute! Hey mimo I donno if you know or if you've mentioned it yet (sorry I have been looking at your blog much lately) but there's a custon furniture in the catalougue for igloos and new room sounds cool, can't wait for other stuff club penguin is doing too! Yeah I like it too. but when stamps came in,almost all the games are for members unlike before. anyway. I think it will be released during The Fair. I can't wait till the Fair. Oh! I bet thats one of the locations for the new entrances to epf hq! Maybe if an agent stands in the gazebo, they will be transported to hq!! That would be really cool! The notice board sounds really cool! I wonder if you will actually be able to post stuff like "FASHION SHOW AT ME SANTA ON MAP!" Then you dant have to stand in the middle of town shouting the message over and over again! I am soo excited! Ya he posted that already. Check a few posts down. that seems so cool! What book is that because I just NEED to buy it!? Yeah but im just being patient cuz im afraid i might be moved off. eek! and btw my name isnt gonna be capitiolized because i dont feel like it anymore. I think that this is from the newspaper and it will bein tomorrow's paper! Yo! I just relised something! The plaza shows the pet shop having ONE door, yet in the petshop, it shows that the pet shop has TWO doors! I think it will be for everyone who has the new CP game day code. Brilliant. Now penguins dont have to keep shouting PARTIES! People can just look on the noticboard and go! i think its the secret room u get when u buy the wii game. WOW MIMO THIS GOING TO BE SO COOL! 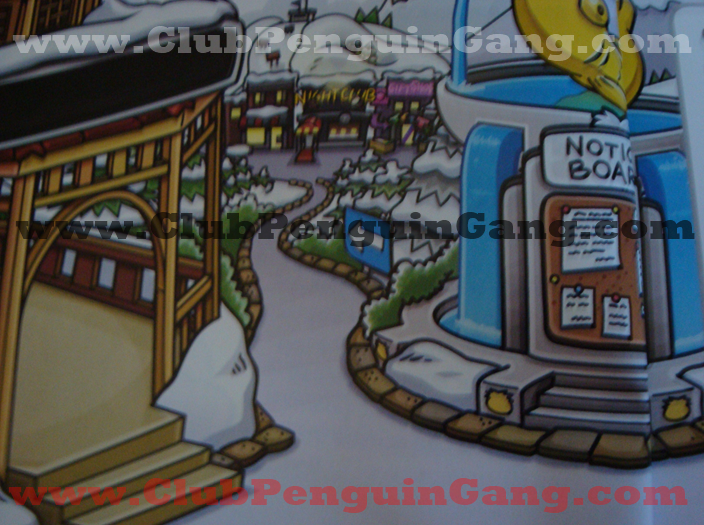 Does anyone know which club penguin book this is from because it looks like its from a club penguin book! wait when was the mountain closed?someone plaese answer me! 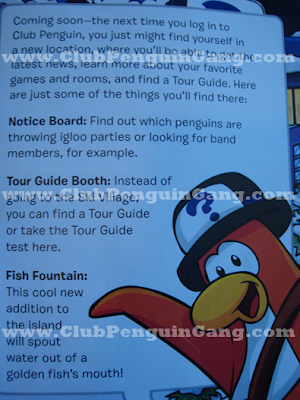 The map symbol for this room is probably a lamp post, as shown in The Awesome Official Guide to Club Penguin: Expanded Edition. It is below the Town and Plaza.